The news hit me like I was watching a sucker punch in slow motion. I somehow knew it was inevitable, but I held out hope that a smarter choice would be made by the candidate. Then, shortly after the roller coaster that was the House Committee on Oversight and Reform’s hearing featuring Michael Cohen, the former disgraced attorney for President Trump, a bomb went off. The announcement Texas had held its breath for was leaked to the Press. Beto O’Rourke decided not to seek another run for the Senate in Texas, but inexplicably dive into the crowded field of eight solid Democratic candidates and one solid Independent running as a Democrat, upping the full count to 10 candidates, with at least one more announcement on the horizon. It’s a choice I understand. It’s hard to beat momentum and the upstream flow of people pushing you towards the bright lights of leading the nation. Before he ran, Lincoln was also a failed candidate for a Senate seat and a former Congressman, with limited experience at the National level. But, this isn’t 1860. Beto is also not the only problem in the Democratic Party. Among the current count of 10, there are three white men running for office. Three white men that have looked at a crowded field of candidates and decided not to support Women or People of Color who have every bit of experience as they do, sometimes even more experience than they do. It’s couched in coded language: “I feel I’m the only one that can beat Trump,” was the popular phrase at the beginning of the year. Strikingly said by only white men — the implication completely clear. Democrats best select another white man to beat a white man. No one else need give their opinions. “I can bring the voters we lost back to the party,” which means the white, working class voters, almost exclusively male that consistently vote for Republicans, especially as labor unions have faltered and the middle class has shrunk. The problem is, we’re in an age where the other opinions of the Democratic Party are not only valid, they are becoming louder, I find it difficult to understand why white men simply won’t sit this Presidential campaign out altogether as candidates and amplify the message that we are one nation, that women can be great leaders, that the time for a White Supremacist Patriarchy is nearing an end, but that doesn’t mean a loss of power, as much as it means growing as a country into acceptance instead of division. The Presidential election isn’t the only place where we’re seeing White Men cling to messages of continuing a White Male Patriarchy play out, either. In November and December, after it became clear that the Democrats would be in control and need to pick a Speaker, White Democratic Men led the charge to pit a woman against another woman. This was after women won astounding victories — and an energizer newcomer to the national level unseated the 4th most powerful Democratic White Man in the primaries. The Democratic Party is largely supported by Black Women, in particular and People of Color in General. We only talk about “identity politics” as a negative phrase when it affects the power dynamic of White Men in this country. Bring up the fact that Trump operates in an identity politics narrative and you’ll be immediately dismissed by many. However, the many People of Color in our Party fight for it, they fight for the candidates and they have long fought for the best candidate, often consistently at their own expense. Hand in hand with politics is the problematic press pushing the narrative against Women, especially Women of Color and, to a lesser extent Men of Color. The ludicrous stories about how women candidates dress and how or what they eat continue like we haven’t learned anything since 2016. That many of the mouthpieces for the press or their editors are White Men compounds the problem, as does the fact that White Men elevate each other’s pieces, ensuring that the noise we keep hearing stays white (and male). Turn on any news channel to listen to any of the pundits and with rare exception, you will always see white men and one or two Men of Color, White Women, or Women of Color. Go one step further and pay attention to who gets to talk first on the panel, who gets asked the questions first, who yells and shouts over other guests more to make their points heard? We have heard from White men in the Democratic party that they’re not misogynist and they’re happy with their fellow Women, Women of Color, and Men of Color colleagues. Very few of them stand up for those Women of Color when they are bombarded by attacks from the press, not entering a fray to use their voice or their privilege to show how other men are abusing their own privilege with a different set of standards for themselves as the women they are unfairly targeting. While we scream that the Republican Party is no longer the party of Lincoln, we should also assert that the Democratic Party is no longer the party of Kennedy and that’s a GOOD thing. 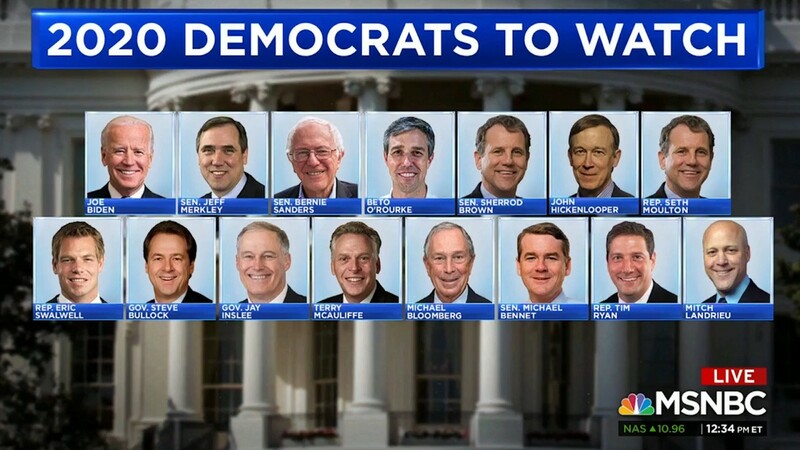 However, with every new White Man’s entry into the 2020 Democratic Primary, I feel the need for a primal scream. If you want to do what’s best for the party, and what’s best for our nation, White Men? Have a seat and listen for a minute.